Most readers of this site will no doubt be familiar with Boney Mountain. 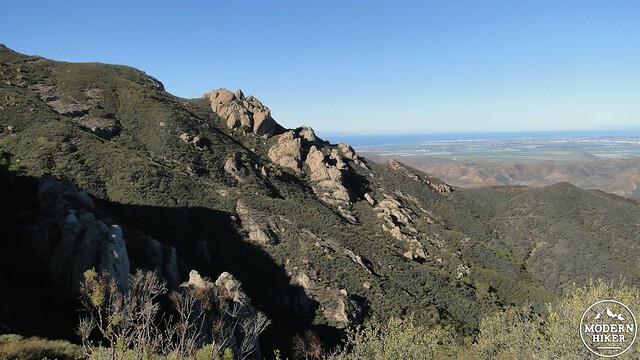 The high point of Boney mountain is Sandstone Peak, which is a focal point for some of the best hiking on the west end of the Santa Monica Mountains. 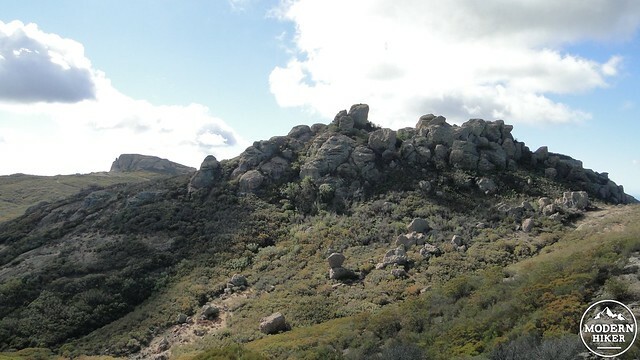 The Mishe Mokwa Loop to Sandstone is one of the classics of SoCal hiking, and Modern Hiker has long touted it for its numerous virtues. 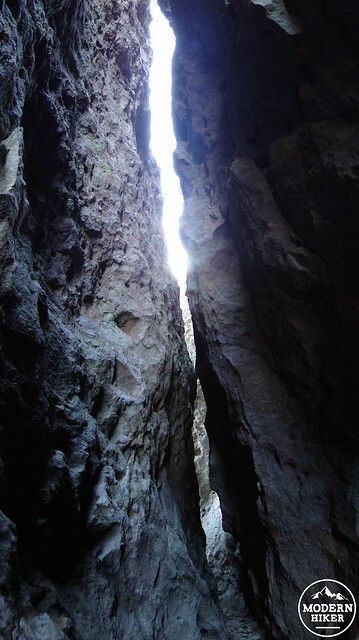 In addition to that particular classic, there is a lesser known route that reaches the Tri-Peaks formation that is every bit as much of an adventure. It’s also a bit of a leg-buster, as the route up the north side of Boney Mountain will earn you more than a few chocolate chip cookies. 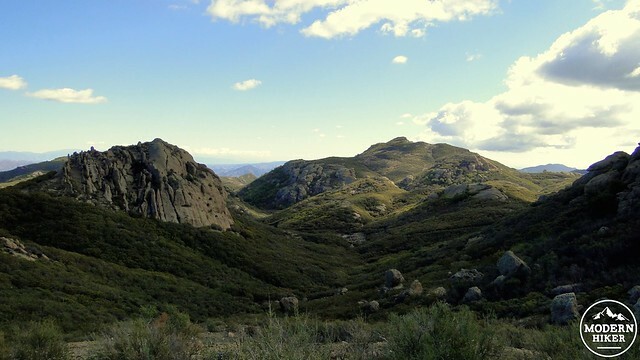 This route passes through the Satwiwa Cultural area, which features a network of leisurely trails while also connecting to Sycamore Canyon and the route up to Danielson Monument. From Danielson, the comfortable fire roads vanish before a steep, rocky, badly eroded, and occasionally even slightly treacherous social trail through tall chaparral takes over. After an exciting and slightly nerve-wracking schlep up this rocky trail, you arrive at a rounded summit of volcanic rock on one of the three peaks in the Tri-Peaks formation, where you will find an access trail to some really awesome caves/slots on the north side of the formation commonly referred to as Tri-Peaks (it all gets a bit confusing sometimes). Start out from the trailhead at the dead-end of Wendy Drive and drop down a brief slope over a usually dry creek to enter the Satwiwa cultural area trail network. This trail winds pleasantly for a brief stretch before giving you a honest warm-up on a steep slope. After this slope, you’ll emerge atop a gently rolling grassy area that looks an awful lot like the Shire following some good Spring rains. Keep to the left at the junction and wrap around a hillside to pass the old windmill that’s a holdover from the days when this area was a ranch. This is a pleasant spot to pause and enjoy the rolling grasslands below you contrasted with the rugged summit of Boney Mountain. 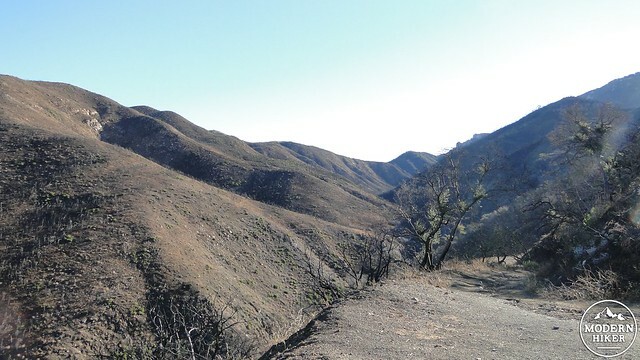 Continuing on, the trail will enter an extensive stretch of burned chaparral that got scorched during the terminal phase of the 2013 Springs Fire. You’ll continue through the burn zone for the next 1.8 miles or so. Sad as the scorched earth seems, this area will likely recover in a hurry, give or take a few wet winters. Chaparral was born to burn, and all chaparral species and most of the trees in the area have evolved to take advantage of occasional fires. For people mourning the Point Mugu area’s unfortunate scorching, it helps to remember that this entire area also burnt in 1993. By 2013, it had become mature again to the point where there was almost no evidence of past fires. The same thing will happen once again. Also keep a look out for the viewfinders along the way that the State Park has erected to allow people to chart the vegetation’s recovery from the fires. 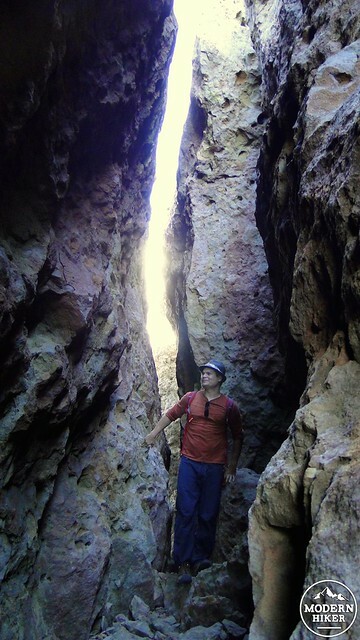 From the windmill, the trail will climb a ridge and then begin a lengthy descent into the shady recesses of Upper Sycamore Canyon. 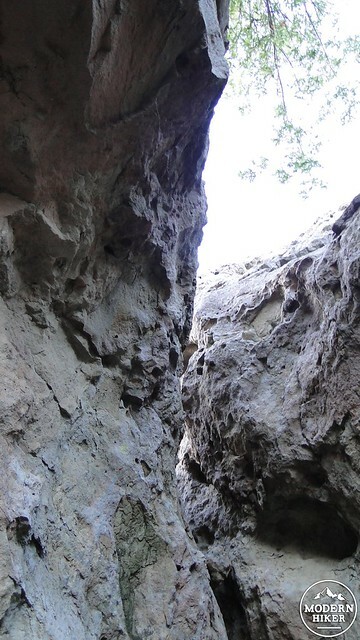 At the bottom of the canyon, you will cross over the oft-dry creek and begin to ascend lower slope of Boney Mountain. 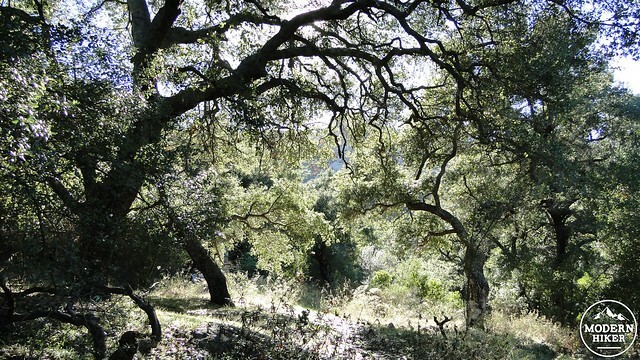 At the very first switchback, you will encounter a social trail branching off on the left toward Sycamore Falls. 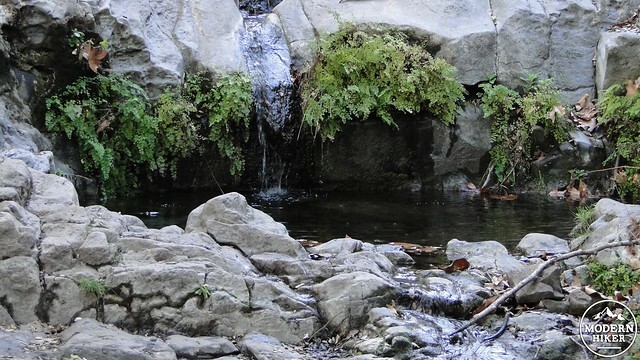 This pleasant grotto is a nice stopping point, and there is often at least a trickle coming down the rocks. 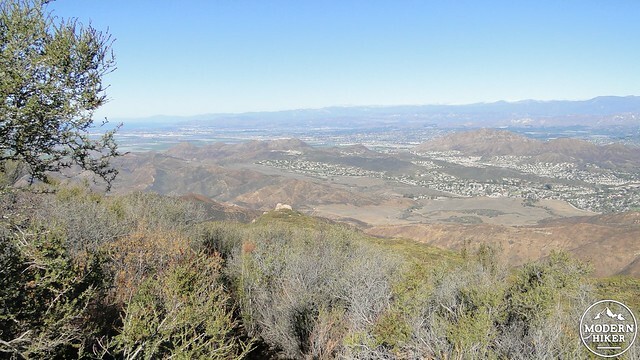 From here, you will switchback your way up to Boney’s shoulder while enjoying expanding views over the Conejo Valley, the Oxnard Plain, the Pacific Ocean and Channel Islands, and along the coast toward Santa Barbara. When the trail flattens out and comes around a bend to the right, you will be treated to one of the finest views in the Santa Monicas. Up above you is the slightly intimidating, but scenic mass of Boney Mountain, with the beige volcanic outcrops reminding you why the mountain got its name. From here, you’ll make a gradual descent into a beautiful shaded grotto with a dense thicket of oaks, sycamores, and a few bay laurel trees. You may notice an old cabin foundation with a chimney still standing on your right. 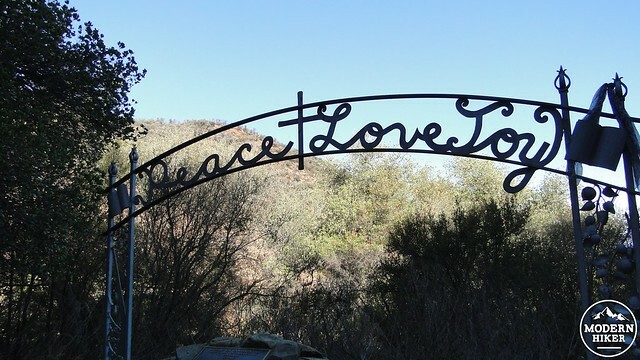 On your left will be a flat area surrounded by a low rock wall with a wrought iron sign that reads “Peace Love Joy.” This is the Danielson Monument, which the National Park Service dedicated to Richard Ely Danielson, the original owner of the land who deeded this land to the government for protection. Thanks, Richard Ely Danielson! The aforementioned social trail continues past the monument traveling left past the old cabin. Right away, you will start climbing up a slope as you work your way toward a really brutal stretch in which you will occasionally end up climbing as much as hiking as you trudge straight up the slope of the mountain. This is not an easy stretch and may prove a bit much for beginners. 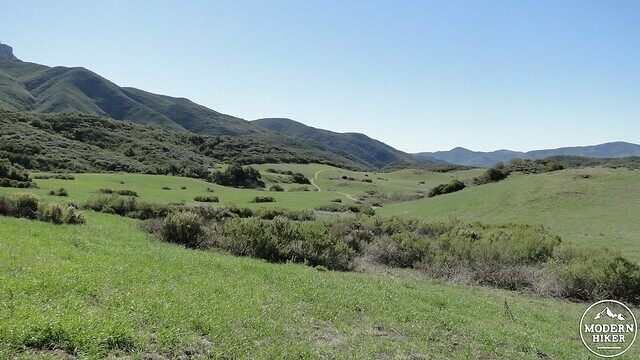 The payoff for this slog is the ever-improving panorama that now includes much of Los Padres National Forest in addition to the other sights you’ve already been enjoying. This long, hard trek up the mountain continues for about 1.4 miles and 1,300′ of climbing before reaching a small knob that will give you a brief reprieve. I mean it when I say brief, as the trail starts running up slope again toward the summit. Before the summit, you’ll come to a barren patch next to some very large volcanic rock outcrops. 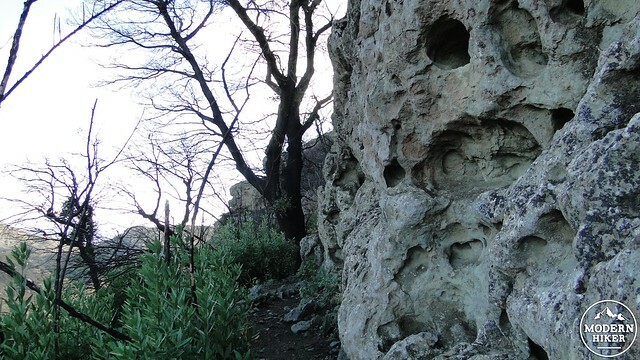 This rocky spot comes alive with shooting stars (the flower, not the meteorites) during spring, and the effect can be quite pleasant. The trail climbs up some more to take a hard left for the final, breathless 300′ climb over .4 mile. The trail wraps around the south side of the summit, which you will attain after a brief scramble. From here, you will get the full payoff, view-wise. In addition to what you saw before, you can now look back over the Boney Plateau, including Sandstone Peak and much of the Mishe Mokwa Trail. 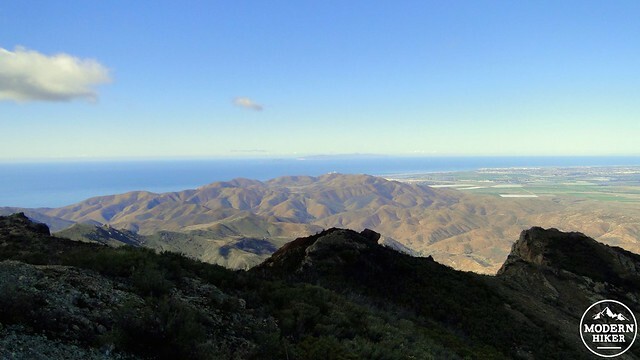 Large swaths of ocean wrap around the rugged spine of the Santa Monicas, while the San Gabriel Range and San Fernando Valley stretches out into the eastern haze. This is an inspired view, but it is not the end of the line. If you’ve come this far, I encourage you to continue on to Tri-Peaks. This side of Tri-Peaks is accessible from Mishe Mokwa, but it takes some real scrambling and bushwacking to get there. 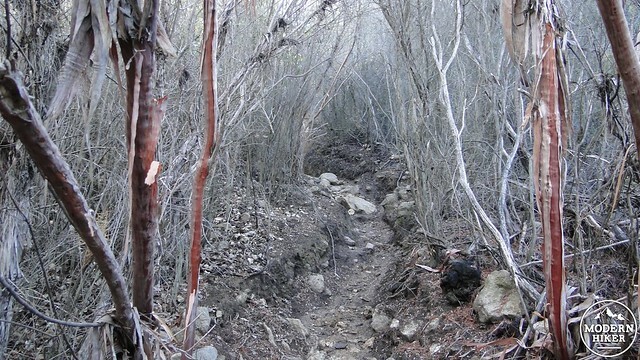 To reach the “back side” from Boney, find the use trail that continues south from the summit along a ridge. The often faint trail will drop through a tiny valley before rising up again to the jumble of volcanic rocks atop a small hill. 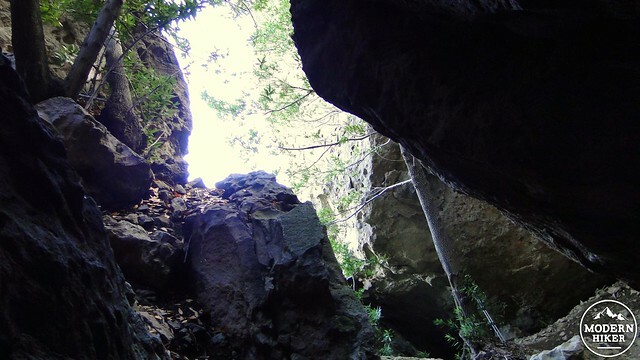 Climb up this hill to reach the base of the rock pile, which you will skirt through recovering vegetation, including fragrant bay laurels, before arriving at a cave. 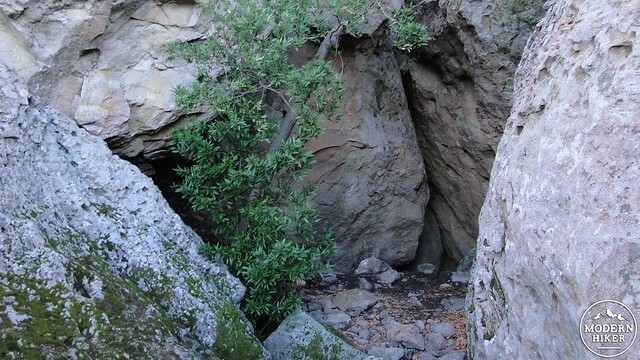 From here, there is a small network of caves and slots through the rock pile that invite an enjoyable hour or two of scrambling and exploring. As I said, it may be possible to scramble over these rocks to reach the Mishe Mokwa and Backbone Trails, but as this track does not include that and as we’ve never done it, we cannot say whether it is safe or provide any direction. If you want to go further, do so at your own risk. There is plenty to see here, though. Just make sure to be safe inside the slots, as it’s possible that rocks may tumble down and take a crack at your dome piece. This is the end of the line, and, eventually, you will begin to make your way back the way you came. The way down is pretty challenging in that the grade is steep, the trail is badly eroded, and the footing can be a little slippery. Pick your way down with care, but save up some energy for a brief climb out of the canyon back onto the grasslands at Satwiwa. 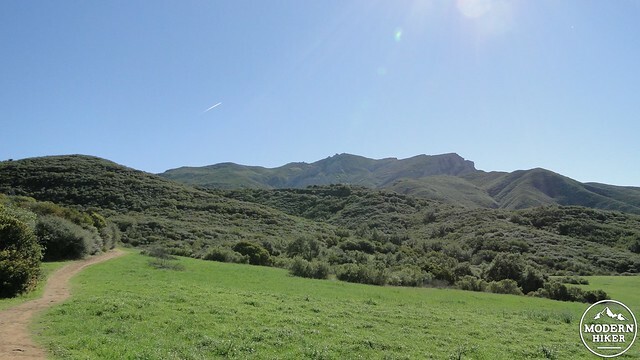 Once you’ve made it back to the car, you can take pride in having mastered a tough hike up to one of the most beautiful spots in the Santa Monicas. 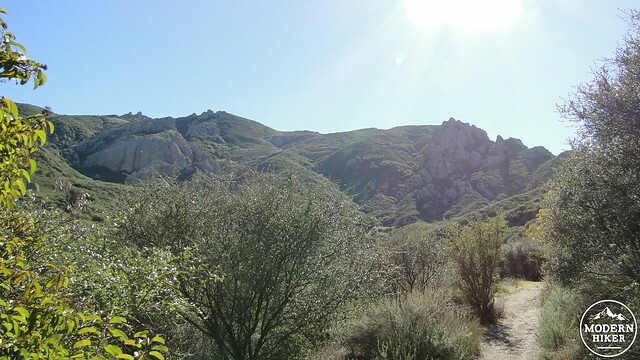 On a personal note – which I have a hard time avoiding when I’m writing about hikes near my hometown, Agoura Hills – this is the first peak I ever “bagged.” I did so a long time ago before I knew much about hiking. It took me four times before I actually found the summit, and the sense of accomplishment made me hungry for more. 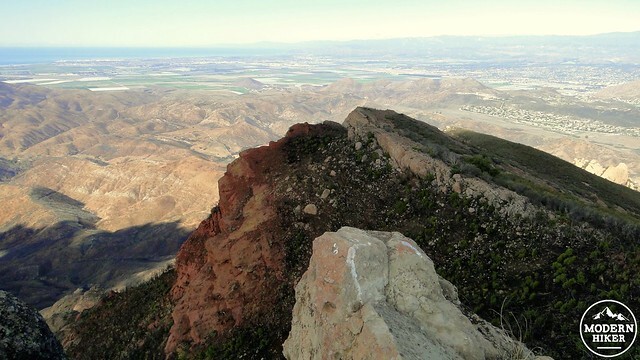 I stood atop this summit looking across the Boney Plateau at what I would eventually learn was Sandstone Peak. I wanted to find out if there was a way to get up there too. After a quick Google search, I stumbled upon this website called Modern Hiker… I was hooked. The first half is easy going, well-maintained trail. 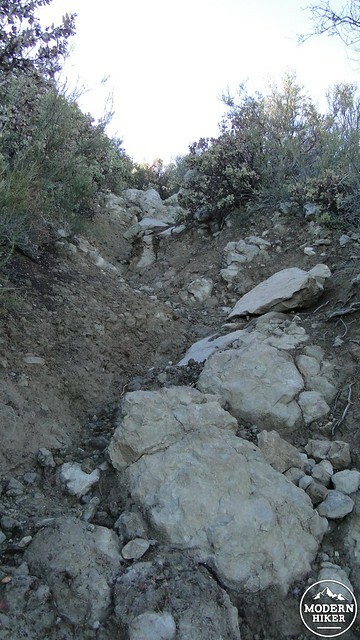 After Danielson Monument, the trail is badly eroded, steep, and occasionally slippery. This is not a maintained trail, and it shows. Use a lot of caution and patience, especially when you're coming back down. From Los Angeles, take 101 North through the Conejo Valley to Newbury Park and exit on Wendy Drive. Follow Wendy Drive until it dead ends at a T-Junction with Potrero Road. Park along the road. Nice day hike. We did it in less than 5 hours and although its steep and strenuous, it not the most difficult of hikes, its a morning or afternoon jaunt worth doing! all distance are round trip unless otherwise noted. Is it 9.9 miles one-way or round-trip? The National Park Service continues to indicate that the parking area along Potrero Road at the south end of Wendy Drive is an official parking area and trailhead. So long as you aren't parking in front of a no parking area, you should not be parking illegally. The Via Goleta parking area is a fine alternative. better directions: from wendy turn right on Lynn (will turn into Portrero), then left at Via Goleta, it's leads down to 3 lots for the Santa Monica Mountains/ Mugu State Park. The directions to park on Portrero there will get you towed. You bet. Hope you enjoy it! The Mishe Mokwa up to tri-peaks is almost a weekly thing for me. Definitely have to do this trail soon, looks fun. Thanks for the heads up, MH. Yes. I have an unfortunate habit of going back and forth with either. I also sometimes use "User-created trail" or "un-maintained trail," but it all adds up to the same thing. Is a social trail what is also known as a use trail?